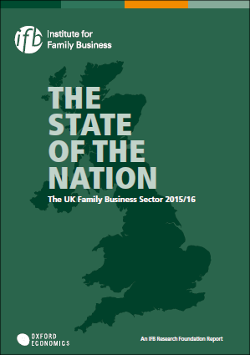 This report examines the role of family firms in the UK economy. It follows on from previous IFB Research Foundation family business sector reports published in 2008, 2011 and 2014. The state of family businesses matters because they make up a large proportion of all UK businesses. Across the length and breadth of the country, small-scale, family-run firms produce goods, provide services and create jobs in all sectors of the economy. They vary widely in size, management structure and longevity. They also face a number of challenges, some of which are unique to family firms. Headline findings include the fact that family businesses employed an estimated 47 per cent of all UK private sector employment and generated 34 per cent of the UK’s private sector turnover in 2014.